Hengameh grew up in North Vancouver and with a family full of dental professionals, she always knew dental hygiene was her calling! 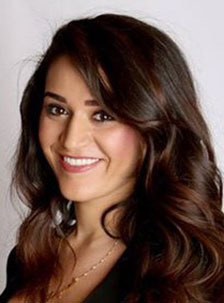 Hengameh attended Vancouver Community College in Sep 2007 and received her certification in Dental Assisting. She then went on to get her diploma from CNIH in Dental Hygiene in Sep of 2011. She has experience working with a variety of clients and prides on the compliments of her gentle and steady hands! Hengameh believes that everyone deserves to be proud of their smile, and this is done through preventative education. She enjoys spending one–on–one time with her clients, and making sure they understand their treatments and options. She wants all her patients to have relaxing and positive visits, and goes the extra mile to make them feel more comfortable. When not working, Hengameh enjoys spending time with her dog, Bella, as well as exploring the city, biking Stanley Park and hanging out with friends and family.